Our passport photos can also be used for a student ID, sports facility or work photo IDs. No appointment necessary! The U.S. government requires two photos with very precise specifications. 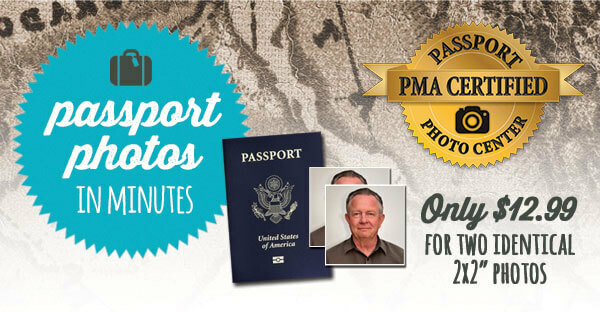 Our passport photos are guaranteed to exceed all U.S. government standards. Before you apply, you'll need to have your photograph taken according to government specifications and printed on passport compliant paper. Because a white background is required, it is strongly recommended that you do NOT wear a white blouse, shirt, or jacket. All other colors are acceptable. Uniforms and camouflage clothing are not allowed. Try to dress, comb your hair, etc. as you will when you are traveling. The closer you look to your photo, the less problems you will have. We suggest you dress somewhat formally and conservatively, because the people who examine your passport tend to be very conservative. There are countries where dress that is too casual or revealing can get you into trouble, so it doesn't hurt if your passport photo - which you'll be using for the next 10 years - is somewhat stuffy. Baby photos require special care. We are experienced at taking passport pictures of children and babies. Passports are only issued by the U.S. State Department. Processing takes 10-12 weeks. We try to keep extra passport applications on hand. The full details are listed on the back of the passport application. Pick one up while having your photo taken. If this is your first passport, you will need to submit the application in person to a trained government official who verifies your ID. Or, forms can be obtained from any passport agency or acceptance facility. Our local facilities are listed below. First time adult application fees are $135. Since the passport fees and execution fees are paid separately, you will need separate checks for $110 and $25. Fees for minors age 15 and younger are $105 ($80 plus $25). Both parents must accompany a minor (age 15 and under) when applying. Adult passports are good for ten years. Minor passports are good for five years. http://www.travel.state.gov/visa/visa_1750.html or talk with your travel agent. The number of photos needed for a visa varies by country. We take visa photographs too. The State Department recommends making two copies of your passport identification page. Leave one copy at home with friends or relatives. Carry the other copy and a spare set of photos with you in a place separate from your passport. This will facilitate replacement at the U.S. embassy in the unfortunate event that your passport is lost or stolen. For the same reason, it's also a good idea to make a photocopy of the various cards in your wallet, just in case.